If you’re looking for a way to enhance videos taken with your iPhone or iPod touch, check out Viddy, a video editing and sharing application. 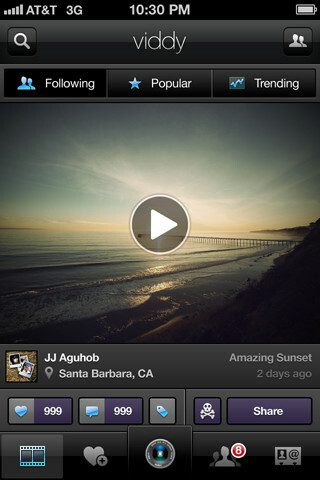 Viddy can also be thought of as Instagram but for Videos as it boasts its own social network. You can either record a new video clip or pick one previously recorded. The videos are limited to 15 seconds. If you pick one that is longer than that, the Viddy app allows you to select the 15-second portion that you want to use. I liked this feature because it didn’t exclude any of my longer recordings. Once you’ve selected your clip, you can enhance it by applying effects to it. Currently, Viddy offers nine choices including “Glam” and “Retro”. The effects have music that has been specifically selected to match the theme. I was amazed by how much my videos seemed to change based on which theme I applied. Some of the versions made me (and my 8-year-old son) laugh out loud. 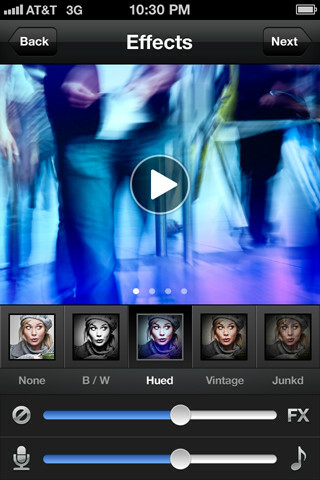 The Viddy iPhone app allows you to control the levels of the effects and of the music. When Viddy is encoding the video with your selected theme, you can watch it in slow motion. Although you can minimize the screen during the encoding process, I enjoyed watching the slow motion. Your video clips can then be shared via Facebook, Twitter or YouTube. In addition, Viddy’s own social network allows you to share your production with others in the community. Members can follow you, or you can follow them to keep up with their latest videos. If you just want to watch some clips, choose between the most popular videos or those growing in popularity. As with all video-sharing sites, there are some quite entertaining clips, and some that are just plain stupid. Viddy’s screens are crisp and very professional. While the majority of the functions are intuitive or easy to figure out, there are a few that are tricky. Having an option for onscreen help would be beneficial especially for those not familiar with video editing. I didn’t realize that it would take some time to save my video after I named it. Instead I hit the “done” button. I was taken back to my main iPhone screen. Messaging about this would be an improvement. The videos seem to take a long time to load, especially since they are limited to 15 seconds. The developers, Viddy, Inc., should focus on how to reduce the time required to load videos. In addition, capitalizing on the larger-screened iPad by developing a native application version would help capture a larger audience. In spite of a few fixable quirks, Viddy is a great free iOS app . While I probably won’t spend a lot of time viewing videos posted by other users, I will definitely use the video enhancement feature. It simply is a fun program. AppSafari review of Viddy was written by Joe Seifi on September 29th, 2011 and categorized under App Store, Free, Social, Video. Page viewed 5318 times, 1 so far today. Need help on using these apps? Please read the Help Page. Viddy is frustrating me. My dad sent me a video of me from HIS iPhone, I saved it to my photo stream. I clicked on the Share Video bottom and then clicked the Chose from MY videos on my iPhone. I trimmed it to be 15 seconds. Everything I go to Encode Audio or Video or add a title, the app closes out to my iPhone home screen. Other videos are uploading just fine. That one video does the same thing every time, and that 15 seconds of that one video was a very proud moment for me. I would be so greatful if I knew why it won’t upload.